SAN FRANCISCO, CA--(Marketwired - Oct 28, 2014) - Xero, a global leader in online accounting software, today launched its new Xero U customized learning environment for accounting professionals and small businesses. This new customized learning approach is key to Xero's strategy of putting education at the center of the Xero experience. The company is committed to offering high-quality educational videos, webinars and events that give small businesses and accounting professionals the exact information they need -- when they need it -- to run, grow and thrive with Xero and beyond. "We're investing heavily in education so that we can teach our customers how to be even more successful in their jobs using Xero as a tool," said Amy Vetter, Xero's Global VP of Education and Enablement. "Up until now, practice owners have struggled to find the training path that is right for the different functions in their firm or business. Xero U will now allow them to find the educational content tailored to their exact role so they can take their knowledge to the next level in a way that is efficient and rewarding." Other companies offer a one-size-fits-all approach that often leads with the product and technology and not the specific needs of the business or individual. Xero is offering a fresh approach based on a person's specific job or role. In so doing, the individual can quickly get the information needed and get back to work. "I love the new role-based training in Xero U because there are so many things about Xero that you can use but they aren't relevant to everyone," said Cristina Garza, founder and chief number cruncher at Accountingprose, a bookkeeping and payroll services firm that serves startups from its co-working office locations in Phoenix and Denver. "I just had a new bookkeeper start on Monday. I can now make sure he gets the exact information he needs for his job without wasting time checking off boxes and digging through content designed for a CFO. And this means that I can get him out there faster working with clients." 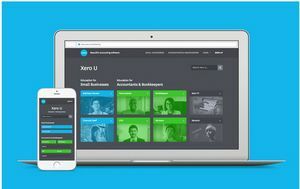 Xero created Xero U's new customized learning approach based on customer feedback. By listening and talking to thousands of small business owners and accounting professionals, Xero created courses, content and the delivery methods to suit their needs. Customers can customize their experience with video, webinars and self-paced learning, and live events. "And this is just the beginning. As a company, we're focused on offering small business owners and accounting professionals even more customized content to help them succeed -- whether it be Xero product specifics or tips and trends on a variety of other topics that keep them up at night," added Xero's Amy Vetter. To find accountant, bookkeeper, financial advisor or small business training, go to Xero U to learn more. Xero is beautiful, easy-to-use online accounting software for small businesses and their advisors. The company has over 370,000 paying customers in more than 100 countries. Xero seamlessly integrates with over 350 third-party tools and was recently ranked No. 1 by Forbes as the World's Most Innovative Growth Company.